This Snake Repeller Ultrasonic Solar Powered Pest Repellent w/LED Light is a perfectly effective way to keep snakes and other pests away, making your property safe for yourself and your family. Transmitting a beeping sound and ultrasonic waves via vibration through the ground of approx. 400-1000Hz every 40-50 second intervals, covering an area of approx. 625sq meters, this humane snake repeller will be sure to irritate and repel the unwanted guests without harming the animals. 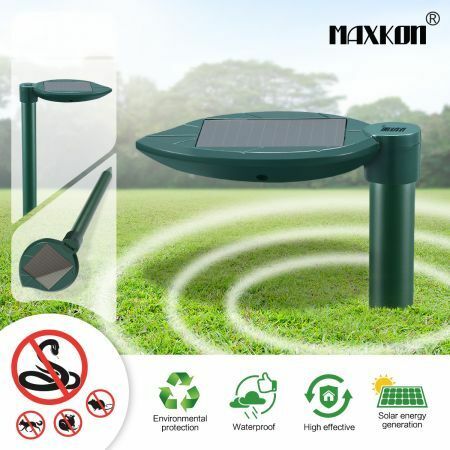 Featuring durable ABS plastic and alumimum construction, this solar snake repeller is water resistant and corrosion resistant. This pest repeller is equipped with a rechargeable long-life Ni-Cd battery which is charged by a solar panel, enabling a full operating continuously from day to night. Two or more repellers are recommended to use at the same time to get the best results. Don't hesitate and buy your best solar powered repeller now. Firstly, please check the ground surface before using it. Frozen soil, irrigated or waterlogged ground is not suitable. Dig a hole into solid earth to place the device. The density of the soil will greatly affect the effectiveness of the device. The more solid the earth has the better efficiency the device will have. 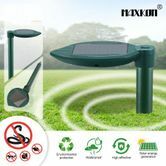 SAFEST PEST CONTROL SOLUTION: The Solar Mole and Snake Repeller is designed to safely and effectively repel underground rodents and snakes by using sonic vibrations. BEST RESULTS: The repeller transmits its signal in all directions approx. 15meters so they can be placed approx. 30m apart in high risk areas, it is always recommended to use two or more units to get the best results. WEATHERPROOF: Durable ABS plastic and corrosion-proof aluminum construction: the control head is watertight and the aluminum shaft has a extra hole for increased range and improved waterproofing! Works perfectly on your yard, patio, driveways, garage, attics, porches, boats, gardens, farms, ponds, etc.